School children in Nigeria are returning to school next week - but not the hundreds of thousands of children displaced by terrorist violence. A native ministry is taking a step in faith to find education at least for some. Islamic extremist rebel group Boko Haram stepped up attacks on civilians after Muhammadu Buhari took office as president of Nigeria on May 29, casting a shadow over the government's recovery of territory earlier this year and adding to the more than 1.5 million internally displaced people (IDPs). About half of Nigeria's displaced people are children, and an indigenous ministry is focusing on their needs. "School children have been out of school now for many months or even years," said the director of the ministry based in the capital, Abuja. "Can we allow these children in the IDP camps to be without schools, when we Christians have the opportunity to show the love of Christ and empower them by giving them schooling?" The government has invited the ministry to help the displaced. The ministry, unnamed for security reasons, plans to send up to 200 children to rural schools in safe areas of Adamawa and Niger states. A sense of urgency permeated the request of the ministry director as he said just $5,000 would be enough to get started with the task of enabling children to go to school. "If we have resources, we could pick up 200 at once, but where will 200 children stay after schools close?" the director said. "We are trusting God for their uniforms, bedding, bathing materials, feeding and other items as the next week approaches. We ask for your prayers for these children." The ministry ultimately will need $7,900 (1.6 million Naira) to resettle the children and $14,900 (3 million Naira) to build and equip lodging for them, he said, adding that total costs for providing education to the children will come to more than $25,000. "We want to start developing a hostel for them," he said. "This is more or less a kind of orphanage, as we will care for them as a complete child until they have grown to be on their own." Frustrated that more churches in Nigeria are not doing more to help the displaced, the director said the time to rebuild what has been destroyed is now - families have lost relatives and all they ever owned, widows abound in the thousands, and daily Christian workers see a seemingly unending number of orphans. "We all must help get them on track again," the director said. "As long as these ones are not within reach of both their needs and the gospel, we owe them a great duty. We need urgent help - we need clothing, food and mattresses. We are also doing this by faith. We only trust that God's people will provide when they see His hands on this." The government has invited the ministry to be part of a trauma healing program and to help develop "post-IDP communities," where people will be equipped to get jobs and become self-sustaining contributors to society again. Most of the displaced people are in the states of Adamawa, Bauchi, Borno, Gombe, Taraba and Yobe, according to the Internal Displacement Monitoring Center (IDMC), and Nigeria's National Emergency Management Agency has also registered people who have fled violence in Plateau, Nasarawa, Kano and Kaduna states, as well as Abuja (Federal Capital Territory). Of all IDPs, 94 percent fled because of Boko Haram attacks, rather than "inter-communal clashes" and natural disasters like flooding. While most were displaced in 2014, up to a third fled violence in the first four months of 2015 alone, according to IDMC. The ministry that Christian Aid Mission has assisted for 28 years has long worked in the predominantly Muslim, northeastern states of Adamawa, Borno and Yobe, which have been under a state of emergency since May 2013. No more than 10 percent of those who are internally displaced in Nigeria end up in IDP camps, with most crowding in with family and friends, according to UNICEF, and the ministry continues to work also among such villagers. Boko Haram has carried out most of its attacks in the northeastern areas in its drive to impose sharia (Islamic law) on the country. Though it has been designated as a terrorist group by the United States and has allied with the Islamic State (ISIS), many of the ministry's evangelistic workers in the northeast refuse to leave in spite of the dangers. They are committed to serving the villagers they are discipling, the ministry director said. "Our missionaries are ready," he said. "Although there are still thousands of IDPs all over the northeastern states, we are trusting that despite bombings, the issue of Boko Haram will soon end in some areas, as the military has overcome their capturing of cities." In the IDP camps, indigenous workers who know the language and culture of the displaced are bringing relief items as well as Bibles and the message of Christ's salvation. The ministry seeks to build a temporary camp in which to station its missionaries, and it seeks $10,000 to transport displaced people and relief items such as clothes, soap and medicines to those who have left their homes behind. "We will plant churches out of these deadly acts of Boko Haram," the director said. "You can pray for the following as we move in a more serious manner now that the government has invited us to help: that God should give us favor in the heart of Muslim victims who will hear the gospel; funding for targeting Muslims and non-believers in camps and for the missionaries there; money to build a temporary camp; and for thousands of children that need adoption and support. 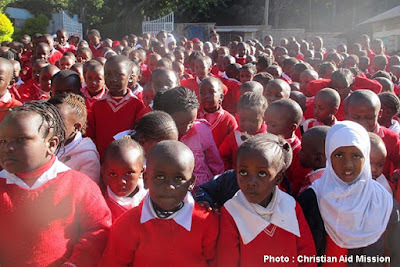 We intend to take as many as God will provide into our schools in other communities."